Fantasy Island has been creating family memories since 1984. Many of the park’s guests visited when they were children and are now bringing their children, grandchildren and even great-grandchildren to continue the traditions. “Guest experience is one of our biggest priorities, which is why our customers come back year after year. 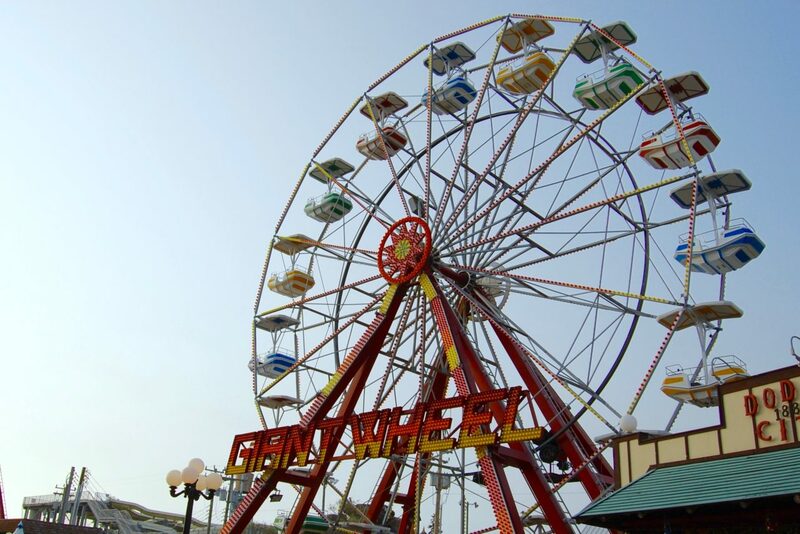 Whether you are visiting LBI for the day, week, month or entire summer season, no trip is complete without riding our Giant Wheel, Carousel or one of our newest rides, like the Hang Ten spinning coaster,” said Jen Quinn, Director of Marketing for Fantasy Island. Their Arcade is the perfect place to come spend an afternoon or evening with some of the newest games available like Lane Master Bowling, Down the Clown and the Wizard of Oz, as well classic favorites like skee-ball. Quinn said with no admission fee to enter, guests can leisurely choose what rides, games or attractions they would like to enjoy. This summer, Fantasy Island has gone digital. All rides, games and attractions will now be using a digital card. “All cards are reusable and can be loaded at any kiosk, ticket booth or the arcade counter. These cards are universal and can be used on any ride, game or attractions. Any redemption points you earn in the arcade will be loaded directly on your card and you can even combine cards to save them all in one place,” said Quinn. If a customer has any redemption points or ride tokens from previous seasons, the park will convert them to digital credits for them. Cards, Tokens and Redemption Points never expire so guests can keep their cards year after year and just reload them when they visit the park. Holgate is a sizable beach that’s free to the public. “Its wilderness designation provides habitat for birds, animals, and plants with an uninterrupted view of the sky, ocean and the bay. This is a prime area in the middle of constant development where people can truly find peace and connect to the environment,” said Graham. In short, this is a part of the refuge where people can find refuge. Graham said their talented and very knowledgeable volunteers and interns will be conducting guided walks at Holgate on Thursdays, Fridays, and Saturdays from 10 to 11 am this summer. One in particular is the “Shorebird Tour” led by LBI resident Michele Budd on Saturdays. She’ll help people learn how to identify everything from Piping Plovers to Sanderlings. Edwin B. Forsythe National Wildlife Refuge is also taking Holgate to the community. So, please contact the refuge at 609-652-1665 if you’re interested in scheduling a presentation at your community centers, camps, libraries and schools. Barnegat Lighthouse State Park has a lot to offer in a small package – natural beaches, access to Barnegat Inlet for walking and fishing, maritime forest and dunes, and, of course, Old Barney. The Friends of Barnegat Lighthouse State Park organizes events at the state park. You can find a list of events here: www.friendsofbarnegatlighthouse.org/.